Hulu has no plans to start catering to binge-watchers with its original programming, preferring instead to release new episodes one week at a time. “We value the shared experience and the joy of the water cooler that is television,” Craig Erwich, Hulu’s senior vice president and head of content, said on a recent press tour according to Variety. Weekly episodes also allow for a steady stream of fresh content and make it easier for users to discover those original shows in the first place, Erwich said. 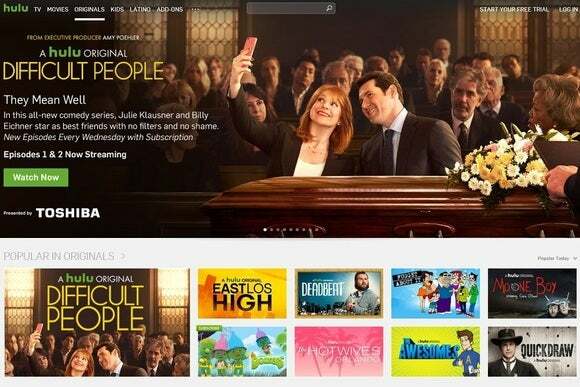 Hulu’s strategy runs counter to that of Netflix and Amazon, which release entire new seasons of their original shows all at once. While this allows viewers to easily get hooked by watching several episodes in one sitting, the trade-off is that any social media buzz around a show can die off quickly after the premiere. For Netflix and Amazon, the answer to that problem is to simply release more original content. By 2020, Netflix says it wants to launch one new show every two-and-a-half weeks, and it plans to carry original movies that bypass the typical theatrical release window. Amazon has also said that it will “double down” on original programming. By comparison, Hulu may be covering for the fact that it hasn’t invested as much in high-quality originals. While Hulu has churned out plenty of homegrown shows, none have matched the critical acclaim of rival series such as Netflix’s House of Cards or Amazon’s Transparent. Hulu is only now starting to focus on high-profile hits—such as the J.J. Abrams-produced 11/22/63—so it has a lot of catching up to do. The story behind the story: The plan to stick with weekly releases underscores how Hulu is more like traditional TV than its rivals. Unlike Netflix and Amazon, Hulu also carries advertisements, even for subscribers to its $8 per month premium service, and non-subscribers get delayed access to TV shows unless they sign in through a pay-TV provider. As a company owned by major TV networks, Hulu won’t be giving up some of those traditional approaches without a fight.